Members who join the annual visit to Yevres are very familiar with this grand old lady, and it is with deep regret I have to report of her passing. My thanks to Arnauld Theron for supplying me with the following information. 89 years old, Solange SILLY died Monday evening. After a life of service to others. Solange SILLY died Monday at the age of 89. A member of the resistance during WWII and engaged in community life in the region of Châteaudun there after, she was also an example of modesty. 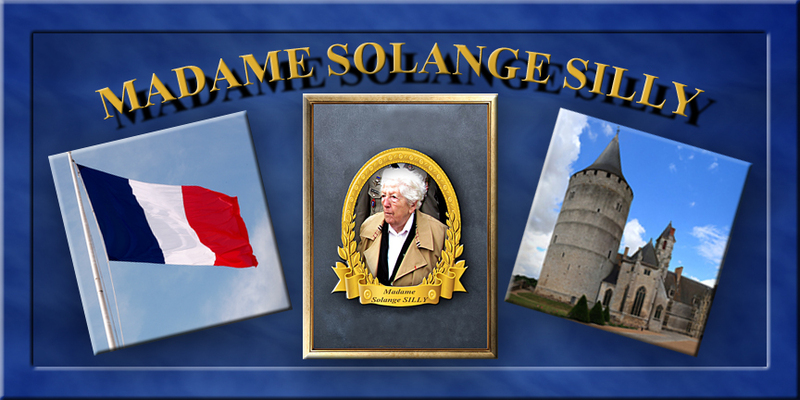 Solange SILLY died Monday evening at the Châteaudun hospital, at the age of 89 years. A very modest lady, she was never very talkative about her past as a member of the resistance, and later as a volunteer in local associations. But history has imposed in spite of herself as a matter reference at Châteaudun. As a young Lady, she joined the Resistance (her family), as she liked to emphasize, at the age of 19. Born at Bonneval and educated in the town of Saint Christophe, Solange Meret came with her parents and brother to the farm of Saint Martin, at Chateaudun, in1940. Solange, who has worked alongside her father would recover the weapons dropped by parachutes, in parts, by Allies and reconstituted weapons. 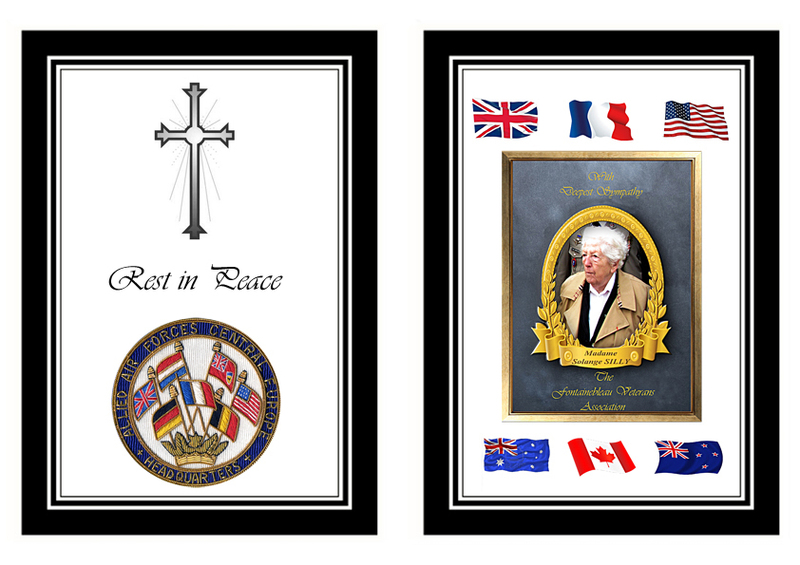 In 1944, she helped the COMETE network to convey shot down English airmen, to the shelter of the Bellande forest, in the department of Loir et Cher. She even stopped by the Gestapo on April 18, 1944 and taken to the prison of Chartres where her father will get it. Luckily, she was not the person that the Germans sought. Installed later with her husband in the food bar THE BERGERAC, rue Saint-Jean, she invests, having sold it in 1979, to the retirement age, in many associations: communal center of social action, family associations, restaurant heart, food bank and youth workers center. She does not forget the Duty of Memory and takes some responsibility in patriotic associations. She is president of the association of Former Resistant of the southern sector of the department of Eure et Loir and treasurer of the Departmental Association of Voluntary Resistance Fighters. 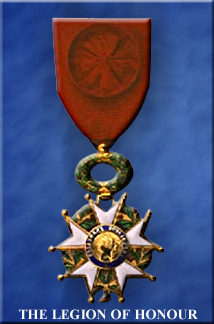 Solange SILLY received the CROSS Knight of the Legion of Honour in October 2006 by Marie-Helene FRANCOIS, who was the first assistant Mayor. And to this moment again, she was almost surprised that a person could think of her. "I am very happy but I did not expect such an honour", she said with the same modesty. Solange SILLY will be buried Friday, November 30th, in the afternoon. 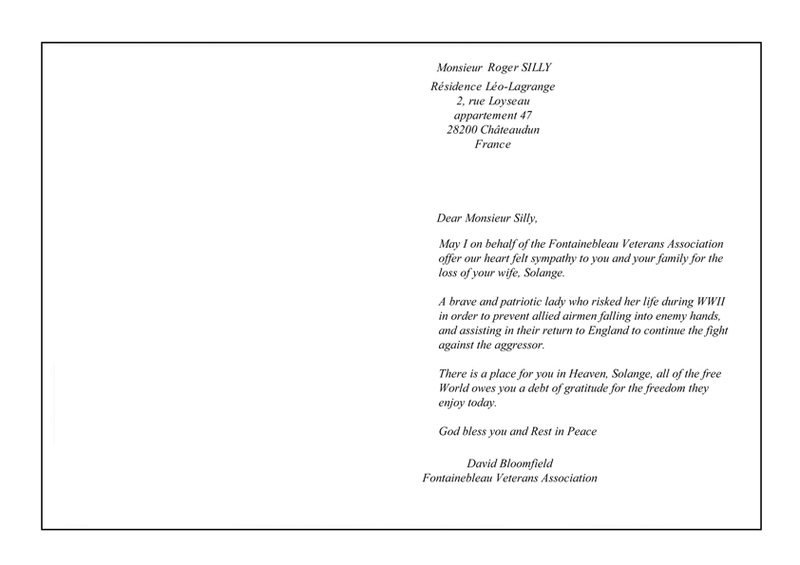 I have sent the following card of condolences to Monsieur Silly on behalf of the Fontainebleau Veterans Association. I just received a message of thanks to Mr. Silly and I enclose a copy of the letter and the translation. My whole family is very touched and thank you for your expression of sympathy at the death of Solange SILLY, my wife. Thank you to transmit my message to friends that I don’t have address, Denise Boneham, Mary Mears and of course David Bloomfield which I received a beautiful card that will stand as a testimony of our cordial and fraternal exchanges. Toute ma famille est très touchée et vous remercie de votre témoignage de sympathie à l'occasion du décès de Solange SILLY, mon épouse. 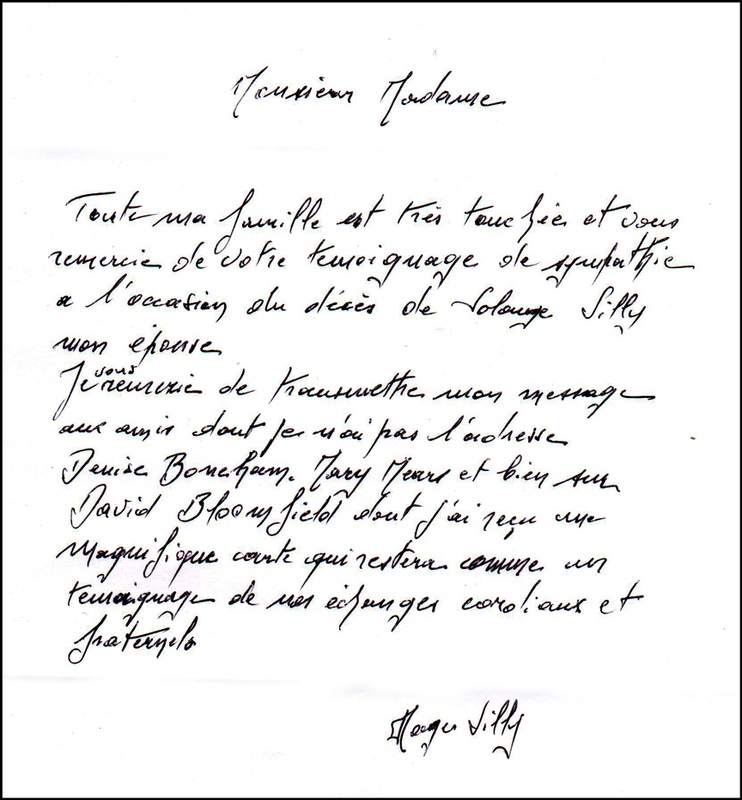 Je vous remercie de transmettre mon message aux amis dont je n'ai pas l'adresse, Denise Boneham, Mary Mears, et bien sûr David Bloomfield dont j'ai reçu une magnifique carte qui restera comme un témoignage de nos échanges cordiaux et fraternels.